The #MeToo movement was started to spread awareness for sexual violence against women. #allwomen have experienced this sort of violence, be it being told kids who mistreated us must like us, or not to dress certain ways because it provokes men. Women are not the only ones who experience sexual violence, so I have included a wording change to “people” instead of women in another version, but it should be clear that this movement does not suggest or belittle the experiences of men – it simply focuses on those of women, I have only included this so men wanting to join in may feel more comfortable. 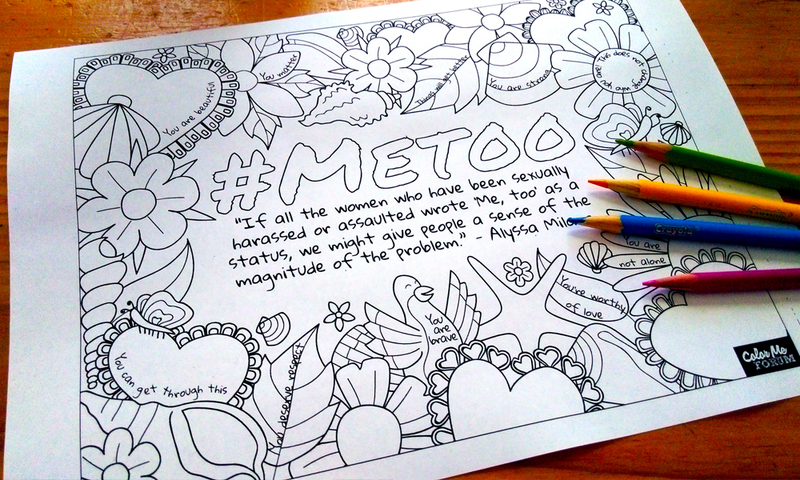 This page contains the message to spread awareness, as well as beautiful positive affirmations for those who may need the courage to share their story or just a “#metoo” post. It contains beautiful imagery around it to remind us all no matter what we are beautiful. We do matter. We are worthy of love and respect, and we deserve it. Color this to show support for your friends and family members, or to add your voice and story. Let your friends who are too afraid to speak up know they are not alone! Please hashtag your share with #metoo to add your voice to the movement!